Asthma is a chronic inflammatory condition that causes the constriction of airways in the lungs. The lungs of an asthmatic are inflamed, making them sensitive to a variety of triggers such as allergens or exercise, which results in an asthma attack. In an asthma attack, the smooth muscles around the lungs constrict due to the triggering allergens and the airways narrow resulting in typical symptoms of difficulty in breathing. Typical symptoms that asthma patients experience are shortness of breath, increased mucus production, wheezing, coughing and tightness in the chest area. The causes seem to be a mix of genetic and environmental interactions. There are several theories on why there is such an increase of asthmatic patients in our age. Many believe that children are reared in an environment that is too sterile and don’t get exposed to all the non-pathogenic bacteria and viruses that they used to. Other environmental causes have also been associated with asthma such as air pollution, vaccination and toxic chemicals found in our homes. THC acts as a bronhodilatator by means of CB1 mechanism that relaxes the smooth muscles in the lungs. THC binding to CB2 receptors also activates suppression of allergen-induced airway inflammation. CBD has an anti-inflammatory action trough the modulation of the immune response, that causes the infalmation of the bronchus. There are also other cannabinoids and terpens that have positive effects on patients. CBG, CBC, CBN and THCA all have anti-inflammatory properties. Also terpens, that are found in cannabis in a small percentage, have anti-inflammatory effects and some act as bronchodilatators. As both THC and CBD have positive effects on all the symptoms, a strain with a 1:1 ratio (THC:CBD) is advised. Also strains that have a higher percentage of alfa-pinene and limonene are recommended for their bronchdilatatory effects as well as reducing the psychotropic effects of THC. 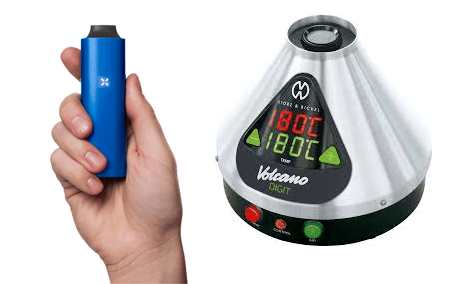 The recommended method of cannabis consumption for asthma patients is with a vaporiser. This way of consumption guarantees that there is no burning of the plant material, as only hot air goes trough, taking with it all the beneficial constituents. Fast onset of relief and ease of titration are benefits of using a vaporiser. It is also directly delivered to the place inflammation which aids in the speed of action. Smoking cannabis is not recommended as burning of the plant material produces chemicals that are toxic and irritate the lungs. This can provoke an asthma attack or worsen it. You can also use an extract in a tincture (diluted in alcohol or glycerol) used as drops taken sublingualy (under the tongue).